Songkhla, Yala (Thailand). April 7.– Universiti Kebangsaan Malaysia looks forward to working together with academic colleagues in Thailand, particularly southern Thailand and Rajabhat University through the linking of their various expertise, research output and other resources in the service of society. Its Vice Chancellor, Prof Tan Sri Dato’ Dr. Sharifah Hapsah binti Syed Hasan Shahabudin, said today this cooperation is not confined only to social and economic development but also the protection and preservation of the environment and the natural resources of the two countries. Prof Tan Sri Sharifah Hapsah, who is here to receive an Honorary Doctorate in Educational Administration from Yala Rajabhat University tomorrow, told a press conference today that UKM would be happy to collaborate and share its experiences in some particular areas that are of great relevance to Rajabhat University. She singled out the development of human capital, starting from young as one area for this. Prof Tan Sri Sharifah Hapsah said the honour is not for her’s alone but also UKM’s, the National University which has been mandated to promote Bahasa Melayu as a language of scientific knowledge. She added that said she was determined to take UKM to greater heights and would collaborate with her international colleagues in advancing knowledge and to reap its benefits for the betterment of society. UKM as one of the four research universities selected by the government has been involved in various research activities over the last 40 years. It is now consolidating its research and educational services to gain prominence as an important contributor to the advancement of knowledge nationally and globally. She said it will focus in eight multidisciplinary niche areas: Challenges in Building a Nation State, Sustainable Regional Development, Medical and Health Technology, Renewable Energy, Climate Change, Nanotechnology and Advanced Materials, Biodiversity for Biotechnology Development and Content-base Informatics. UKM is heavily involved with the work of the Prime Minister’s wife in preparing children from an early age to be good citizens and leaders of tomorrow through the Permata Negara or Every Child is Precious programme. The programme is aimed at giving children from low income families a good start in life by providing quality early childhood education and care. The programme has to date rolled out hundreds of early childhood education and care centres throughout the country, she said. UKM has also been given the responsibility of starting a camp for gifted and talented children (Permata) to provide learning opportunities where the children are challenged to their maximum potential. The programme recognizes that gifted children have special learning and emotional needs. A school for gifted children aged over 16 years is being built in the UKM campus and will take in the first group of 150 students in January 2011. UKM is also conducting another national programme for youths at risk (Perkasa Remaja). The programme grew out of UKM’s research on the social problems of youths including school drop-outs, those who loiter and those riding dangerously on motorbikes (Mat Rempit). The programme consists of a community based project where the youths and their families work with university students to develop a better vision in life and to develop knowledge and skills for productive citizenry. Prof Tan Sri Sharifah Hapsah said UKM’s Institute of Ethnic Studies (KITA) is also playing an important role in contributing ideas, conceptual framework and tools for monitoring inter-ethnic harmony in consonant with The Prime Minister, Dato’ Sri Najib Tun Razak’s 1Malaysia concept. The concept recognises unity of the people while valuing diversity as an important asset in achieving a common purpose for peace, harmony and national development. She suggested this as another potential area for collaboration between UKM and Rajabhat University. Another area of strength of UKM is the presence of many research institutes, faculties and centers promoting sustainable development. She said UKM places great importance on linking its research for socio-economic development to local communities. The Langkawi geopark is an example of how research can contribute to the award of UNESCO’s first Southeast Asian Global Geopark status to Langkawi bringing with it the attraction as a sustainable ecotourism destination. Tasik Chini, the second largest inland lake surrounded by wetlands is also conferred the UNESCO Biosphere Reserve status in 2009 with contribution of over 15 years of research by UKM. 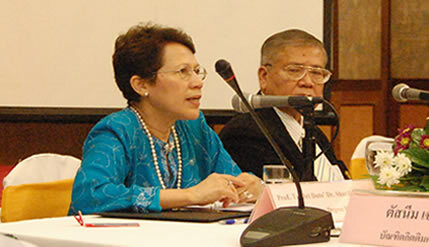 Prof Tan Sri Sharifah Hapsah said both universities have a lot to learn from each other and hoped that there will be more student and staff exchanges to forge closer ties between Malaysia and Thailand. She also mentioned of her ties with southern Thailand going back to her maternal great grandfather who migrated from Morocco to settle in Satun/Setul where he married a local lady Halimah. They later moved to Kedah where her maternal family took roots. She felt blessed that she now has the chance to renew the relationship through UKM’s association with Rajabhat University.